I've been playing with yeast more. I'm trying to avoid baking sweet goods because I'm on a diet. So what else do you bake that's not sweet? Bagels of course! These bagels were delicious! I made plain bagels, to poppy seed, to garlic! Combine the water, yeast, and 3 tablespoons of the sugar in the bowl of an upright mixer fitted with a dough hook. Stir and let stand until foamy, about 5 minutes. Gradually add 4 cups of the flour and the salt, and mix until the mixture comes together. Grease a large bowl with 1 teaspoon of the oil. Place the dough in the bowl, turning to coat. Cover and let rise in a warm, draft-free spot until almost doubled, about 1 hour. Remove from the bowl and punch down the dough. Divide into 12 equal pieces, about 2 to 3 ounces each, measuring about 4 inches across. Form each piece of dough into a ball. Roll each ball into a 4 to 6-inch log. Join the ends and place fingers through the hole and roll the ends together. Repeat with the remaining dough. Place on a lightly greased surface, cover with a clean cloth, and let rest until risen but not doubled in a draft-free spot, 20 to 30 minutes. Grease a baking sheet with the remaining teaspoon of oil. In a large, heavy pot, bring 12 cups of water and the remaining tablespoon of sugar to a boil. 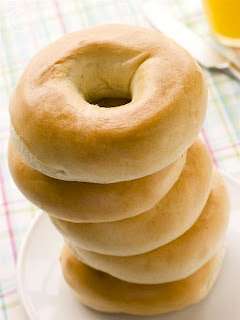 In batches, add the bagels to the water and boil, turning, for 30 seconds to 1 minute. Dip the bagel tops in desired toppings. Flip bagels onto the prepared sheet pan. Bake for 5 minutes, turn over and cook for another 30 to 35 minutes. For our 2 year anniversary, I made him a heart shaped cake. It is red velvet. I took forever to pipe the roses on the cake. I had hours of practice, and they still don't look too good. I didn't even have time to take pretty food photos! So the reason I took a while to start posting again is because I was busy. Busy planning our WEDDING!!! =] I've been looking up photographers, and wedding venues, to dresses. You name it. In addition to all this, I went on a diet...I started to avoid baking. Forgive me! Preheat oven to 350 degrees F. Whisk together cake flour, cocoa, and salt. With an electric mixer on med-high speed, whisk together sugar and oil until combined. Add eggs, one at a time, beating until each is incorporated, scraping down the sides of the bowl. Mix in food color and vanilla. Reduce speed to low. add flour mixture in three batches, alternating with two additions of buttermilk, and whisk well after each. Stir together the baking soda and vinegar in a small bowl (it will foam), add mixture to the batter and mix on medium speed for 10 seconds. Line a heart shaped 6 inch cake pan with parchment paper. Pour the batter in the pan. Bake for 30-35 minutes, or until a knife comes out clean. Transfer pan to a wire rack. Allow to cool before removing the cake from the pan. With the whisk attached to the mixer, mix heavy cream on high for 1 minute. Add powdered sugar and continue mixing under stiff peaks form. Add more sugar to taste. Frost cake.